100% refined Brazilian carnauba wax. Easy on, easy off application. Perfect for paintwork, glass, clear plastic lenses, metal, wheels, and more! Protection from harmful UV solar rays. Enhances a slick wet finish. Prevents water spots and contamination stains. InstaWax is the fastest and easiest way to wax, shine, and protect any vehicle. Traditional waxes require messy, tedious, and time-consuming application processes to get great results. InstaWax sprays on in seconds to shine and protect any color vehicle from harmful pollution, bug and bird stains, water spots, and more! Natural carnauba wax and optical grade spray sealants shine and protect paintwork, polished metal, clear plastics, and glass. InstaWax is blended with advanced UV blockers to protect your vehicle from the harmful effects of the sun. Simply mist InstaWax over a clean surface, allow it to dry to a haze, then buff off with a premium microfiber towel. Use InstaWax on freshly-cleaned surfaces, wet or dry. 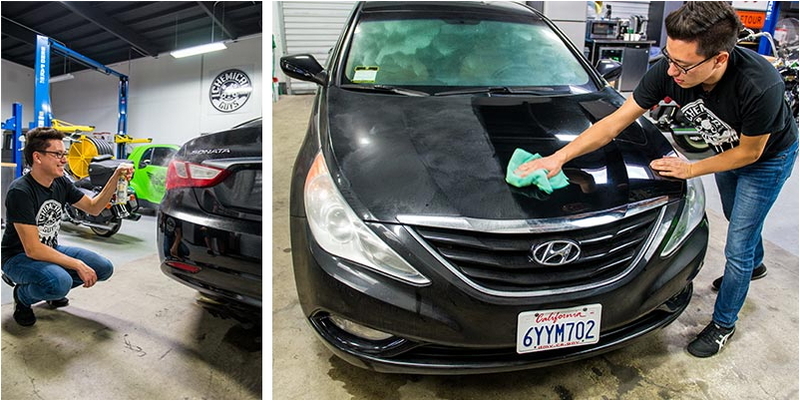 Wax, shine, and protect your vehicle in seconds with Chemical Guys InstaWax. InstaWax Liquid carnauba shine and Protection Spray is the perfect solution to keep your car, truck, motorcycle, or RV looking amazing with outstanding protection against the elements. InstaWax advanced spray wax formula will change the way you wax your car forever. While traditional paste and cream waxes require a time consuming application process, InstaWax sprays on in seconds to shine any color vehicle and provides protection from harmful airborne pollution, contamination, and water spots. Simply mist InstaWax over clean paintwork, metal, glass, and clear plastic, allow to dry to a haze, then buff off with a clean microfiber towel. The car is now sealed against the elements with a premium warm shine that lasts for months! 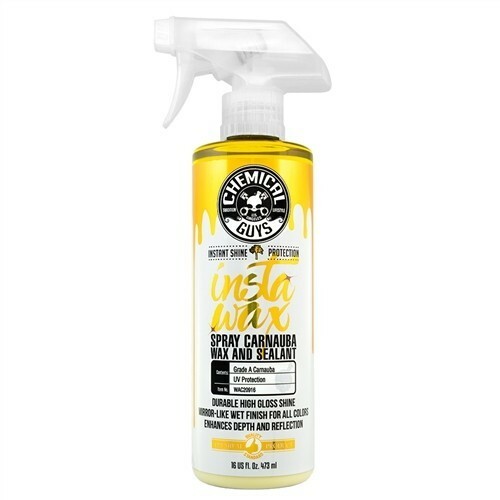 Automotive enthusiasts have prized carnauba wax for the warm, wet, natural glowing shine that it gives to every paint color. Just one coat of 100% carnauba-based wax enhances a deep wet lustrous shine that stirs emotions and stuns onlookers. InstaWax is blended with premium all-natural carnauba wax for a deep wet shine, and synthetic sealant technology for durable protection against the elements. The blended coating creates a protective layer that shields your vehicle’s finish from airborne pollution, fallout contamination, stains, and water spots—and looks good doing it! Spray wax technology has made detailing faster and easier than ever imagined. Traditional waxes require time consuming application processes and methods. InstaWax makes waxing any car faster and easier. The spray wax technology allows the product to be sprayed on a microfiber towel, applicator pad, or even directly onto the surface. InstaWax dries in minutes and creates a deep-wet shine finish that is sure to grab attention. Spray wax technology allows InstaWax to be applied to painted surfaces, glass, metalwork, clear plastics, and even wheels. Spend less time waxing your car and more time enjoying it! The carnauba-rich InstaWax formula brings life and protection to any color vehicle: Black is transformed with a warm, dark luster; blue shines as bright as the sky; and metallic silver shimmers in the sun. Car enthusiasts prize InstaWax for its ease of use, supreme versatility, and fantastic results across their diverse car collections. InstaWax is the perfect choice for maintaining any color vehicle and keeping the finish looking great. The quick and easy formula is dust-free, so it can be used in any situation. InstaWax dries fast and applies easily so anyone can wax their car, truck, boat, motorcycle, or RV in just a matter of minutes. Enhance the shine and protect the color of any show car, garage queen, or daily driver with Chemical Guys InstaWax. The Sun is one of your vehicle’s worst enemies. 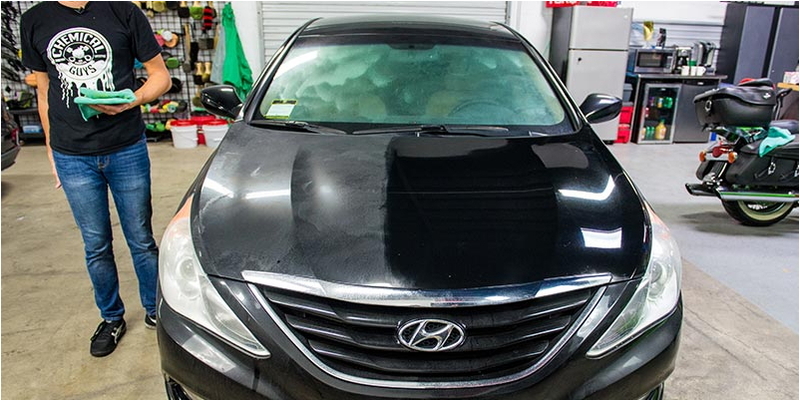 UV rays damage and degrade paintwork and plastic, causing fading, cracking, oxidation, and paint failure. Proper protection is crucial to keep automotive materials looking good, and performing their intended function. Use InstaWax to add extra UV protection to automotive paintwork, clear plastics, and metal surfaces. Apply InstaWax often as your last step protection coating, or use it after washes to strengthen and prolong the life of your primary coating like JetSeal or Butter Wet Wax. Mist a thin coat working one panel or area at a time. For best results, spread into a thin even coat using quality microfiber towel or applicator pad. Allow to dry to a haze. Buff off residue with premium microfiber towel. Use after washes to maintain sealant and wax coat.